I saw a rodeo once when I was in Cuba. It was perhaps one of my favourite memories of the entire trip. I had been in Cuba for a 4-week field trip to study their agricultural system and our teacher had surprised us with the rodeo as a sort of going-away party. We were in the middle of Cuban cowboy country, our last official visit of the trip, and a few of the men and some women put on a show, expertly roping and tackling cattle and riding ferocious looking bulls.It was hot as hell and everybody was waiting for the first rains of the monsoon season to start. Once the men started riding the bulls, the wind picked up – within seconds the sky darkened and huge,fat drops of rain splayed down. The men continued to ride these gigantic bulls, despite the rain and lightning, while we huddled with half the town under the bleachers passing around the bottles of rum our teacher had provided and enjoying the spectacle. Indeed it was a magical experience – utterly and completely different from my last rodeo experience in Somoto. When one of the cousins here ( I long ago stopped trying to figure out how everybody in my adopted family is related) invited me to go to the bi-annual rodeo in Somoto last weekend I readily agreed, imaging something of the sort that I saw in Cuba.So we piled into the back of the pick-up truck and headed to the rodeo stadium. Now I should have perhaps known just by looking at the stadium that this experience was going to be different. 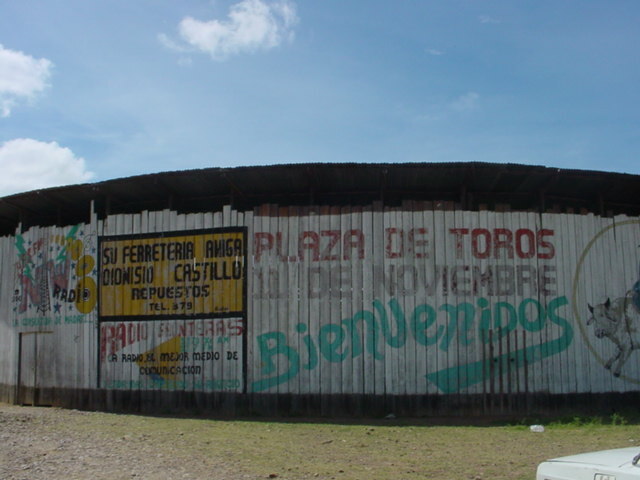 The rodeo stadium or “plaza de torres” is this haphazardly built wooden and corrugated metal stadium-like thing that under no circumstances would pass any kind of safety inspection. It has one entrance door that is also the exit, no bathrooms, and wooden bleachers centred around a dirt circle in the middle with scraps of chicken wire to separate the viewers from the bulls. On top of that it is absolutely jam-packed with people and virtually impossible, once you arrive, to leave. On the way to the stadium we stopped by to pick up one of the other cousins’ 20 month old kid. He casually mentions on the way there that the kid is actually a bit sick. With fever. And vomiting. And diarrhea. Having just finished a workshop the other day on intestinal parasites and infection vectors I am shocked; not only are you dragging a poor sick kid to the rodeo, you are also taking a highly infectious vector to a stadium jam-packed with people. However as I am coming to realize, this is a sad reality of small town life here. The cousin, 19 years old, has another 20 month old kid who he never sees. The mother of the first kid is 17. They are just two kids who want to go to the rodeo and have no one else to take care of their baby. Of course when we get to the stadium and find seats I end up sitting next to the infectious kid who immediately starts fussing and crying. The mother tries to comfort him, breastfeeding him, waving a flashing neon toy in front of his eyes, and passing him between his father, uncle, aunt, and various other relatives to little avail. When the bull riders and cowboys finally enter the stadium I am momentarily distracted from my attempts at trying not to touch anything around me and avoiding breathing the same air as the kid while simultaneously trying to show that I am not in any way put off by the mucous-streaming, horrible-smelling, feverish wad of infection beside me. When the bull-riders come out the stadium erupts in cheers. To my utter amazement one of the bull riders does a bow/jig, falls, and kisses the ground. He is utterly and completely wasted. As it turns out, all the riders and cattle-ropers are to some degree quite intoxicated. My fear of them subsequently being gored to death by the bulls is put to ease when the first bull rider enters the stadium on the back of a bull. The bull has its horns blunted and after five half-hearted bucks, stops, apparently bored.The rider dismounts, stumbles, and falls flat on his face.The crowd erupts into cheers.The cowboys take turns trying to lasso the poor emasculated beast who at this point is standing next to the gate, waiting to be let out. One of the guys in the arena (no idea why they are there in the first place) throws down his beer can, grabs a red cape and proceeds to try and aggregate the bull. The bull throws his head and paws the ground feebly, the guy races to hide between a wooden plank erected as it would seem exactly for that purpose. One of the cowboys has finally managed to lasso the hump of the bull. The gates open and the bull leads the cowboy back to the holding area. The crowd, also largely drunk by this time, erupts again into cheers. The baby next to me suddenly starts to dry heave. The parents, as I now see, have bought from one of the moving vendors french fries covered in mayonnaise and cheese curds and are alternatively feeding the sick baby, themselves and a few relatives who also accept some fries.I swear I can see the infectious germs swarming around the french fries. The dry heaving gets worse and as the crowd erupts in cheers at the second bull-rider who slips in his drunken slumber from another non-moving bull the baby turns and erupts the contents of his bacteria-laden stomach on my shoe. I look at my cell-phone clock. One hour has passed and there are still another eight bull-riders to go. This , truly, is what hell must be like. Thank you for entertaining me on a slow work night. I chuckled to myself several time while reading this.